An unusual event happened in Centerville, Ohio at approximately 5:30 a.m. Saturday morning March 6, 2004. Residents saw a UFO apparently interacting with power lines. The extent of the interaction was explosive in nature, and also involved the burning of tree tops. Flame and ‘glitter’ from the trees were purported to continue for several hours after the event. A detailed account of the UFO’s movements and witness’s descriptions can be found on http://home.fuse.net/ufo. The object of this analysis is to analyze the exposed tree branches for any unusual or foreign materials. Following are photographs of the branches. 1.) 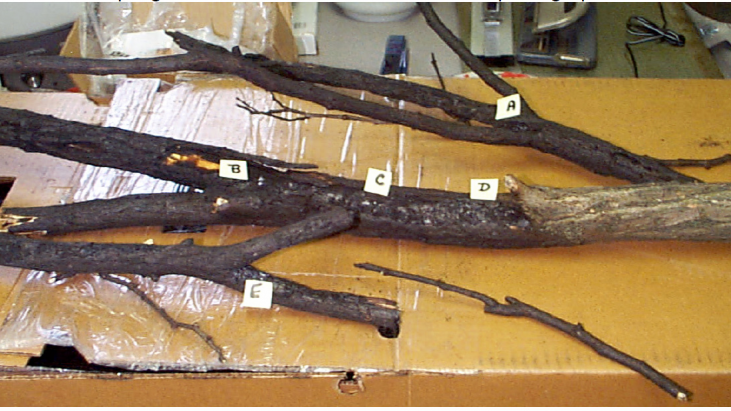 No unusual or foreign materials were detected on the charred and unburned areas of the branches. The results show normal natural products from trees and normal burn byproducts. The natural products include primarily celluloidal material, some natural ester, a small amount of secondary amide, and trace amounts of possible natural carboxylic acid salts. Burning byproducts include carbon, calcium carbonate, calcium phosphate, inorganic nitrate, and organic oxidation products, which are primarily carboxylic acid salts. 2.) It is worth noting that there are no radioactive or fluorescing materials. It is reassuring to know radioactivity is absent. 3.) The results do not confirm or rule out a UFO as a cause of the burning phenomenon. An interaction with such unknown craft could have resulted in normal burning byproducts, and may not have left any unusual residues or craft deposits.